Consider this not-so-fun fact: According to the American Academy of Dermatology, every year up to 50 million Americans battle with some form of acne, making it the most common skin condition in the United States. 50 million Americans. That’s about the same number of people who live in the entire South American country of Colombia! Imagine if everyone you met in a single country was pimply-faced, with skin dotted by blackheads or zits. Crazy, right? So if you thought acne was just a remnant of puberty, think again! With acne being so commonplace, doesn’t it make you wonder what exactly causes it? Read on to find out what the biggest causes of acne are – and the simplest way YOU can combat them. Before we get to what causes acne, we have to first understand what the problem is. In a nutshell – acne is an inflammation of the skin, which usually manifests in the form of blackheads, pimples, pustules, whiteheads, or even cysts. Acne isn’t just a problem of the face. 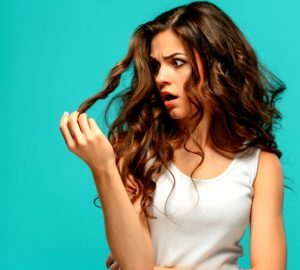 It can erupt in many different parts of the body, too, including the neck, chest, back – even the scalp! Acne is essentially the result of overactive oil glands. These glands can produce an excess amount of oil, which then clogs your pores and traps bacteria and dirt, causing irritation. 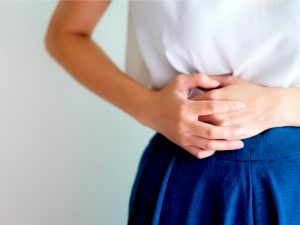 There are certain factors that contribute to making oil glands hyperactive. There are many factors that can contribute to acne-prone skin. To fight acne, you need to understand what causes it so you can do your best to avoid them. The good news is: while there are some causes that you can’t prevent, there are many that are within your power to control. Unfortunately no one (unless you live in the future or are a billionaire with access to advanced scientific technology) can control the genes they get at birth, and when we’re born, we inherit certain traits from our parents. Those traits can include problematic skin. So if your parents (or grandparents) have a history of acne-prone skin, chances are you’ll get that too. But thankfully, there are ways to manage this, such as maintaining a balanced diet. Have you noticed that when you’re rushing to make a deadline or worrying about something, your skin breaks out? It’s no secret that when we’re stressed, it can affect our bodies in multiple ways. A giant zit forming on your forehead is one such way our body handles stress. 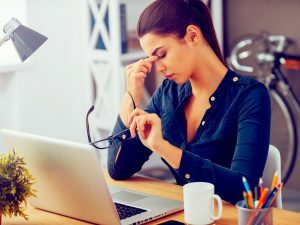 When we’re stressed out, the body releases the hormone cortisol, which instructs our cells to produce chemicals that irritate the skin and kicks our oil glands into overdrive. This explains why when we get flustered or embarrassed, our skin turns red and we start sweating. So you guessed it: a dose of stress hormones plus overactive oil glands is a recipe for an acne disaster! Practicing mindfulness and meditation can help you get your stress under control and hopefully prevent your skin from breaking out. No doubt you’ve heard the saying “You are what you eat.” There’s certainly plenty of truth to that. It’s obvious that what you eat has a huge impact on the body, but what many don’t realize is just how much what you eat directly impacts your skin. 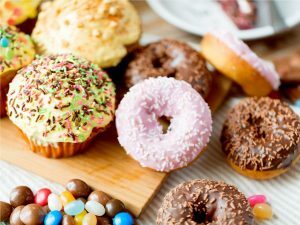 Numerous studies have linked certain foods to acne. In particular, foods with a high glycemic index (AKA carbohydrates) like white rice, pasta, and bread are the biggest culprits. This is because they can cause inflammation of the skin, irritating it and resulting in acne breakouts. So if you want to avoid waking up to an enormous zit on your chin, eating a balanced diet can usually help. This doesn’t mean you cut out carbohydrates entirely, but limiting your intake can transform your skin in more ways than one. Certain medications can result in acne breakouts. 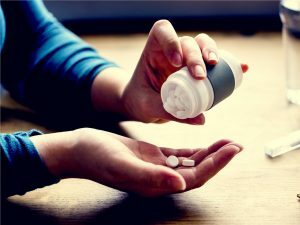 If you have a prescription for medication, be sure to check with your doctor to find out if one of its side effects includes acne. If this is a concern, you can ask your physician to prescribe one that does not have this side effect. The products you use on your skin can also have a tremendous effect. The wrong products can clog your pores even more, or be too strong and irritate your skin. It’s important to know what goes into your beauty products so you can avoid these undesirable side effects. Want to know what works best for problematic skin? Read on for our #1 recommended product! Acne occurs in more women than men, so unfortunately, ladies got the short end of the stick! One of the reasons this is: menstruation! When a woman goes through her menstrual cycle, the body releases more of the hormone progesterone, which causes the facial oil glands to manufacture the pore-clogging sebum. A buildup of sebum suffocates the pores, trapping dirt and residue underneath. The result? You guessed it! Acne. 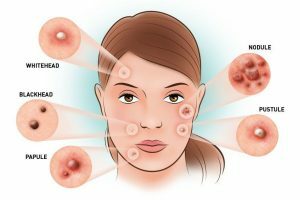 So now that you know about the top 5 factors that contribute to acne, you may be thinking: “How on earth can you avoid getting acne?” Well, it’s simple. Just follow the 3 steps below and you’ll be on your way to clear, acne-free, flawless skin! Thankfully, you don’t have to resort to expensive medications or products with ingredients you can’t pronounce. Just add these 3 simple steps to your beauty regimen and you’ll be acne-free in no time! And let’s not forget: there are products that specifically target acne, too! We can’t stress enough the importance of washing your face. Going outside exposes the skin to a lot of dirt and pollution and, if you wear makeup, this means there’s a lot weighing down your skin. Making a habit of removing all of this residue can do wonders for the health of your skin. While it’s best practice to invest in a makeup remover, what’s even better is getting a high quality facial cleanser that can clear your skin of dirt and residue without irritating it. 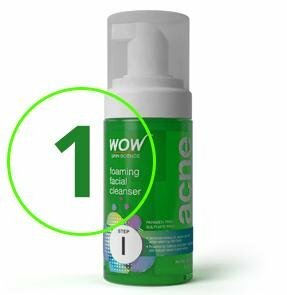 Try WOW Skin Science’s Foaming Facial Acne Cleanser. This gentle cleanser removes excess oil, sebum, and dirt from the skin without overdrying it. What makes it so effective? Salicylic acid – a staple in anti-acne products – and neem and basil extracts, which not only contain Vitamin K (a key ingredient in cell growth), but have antibacterial properties as well. What makes this product extra special? The use of foam instead of a cream base means it goes on lighter on the skin and doesn’t leave any heavy residue. Bonus points! Review of WOW Acne Deep Impact Kit by Soma, Udaipur. A lot of people skip this step in their beauty regimen, to the detriment of their skin. Exfoliating is important because it scrubs dead skin cells and other stubborn residue from your pores, clearing them and giving them breathing room to foster new cell regeneration. Exfoliating can transform your skin entirely because it unclogs your pores and gives way to the younger skin underneath. But be warned: Before you get too excited, not all exfoliating products are made the same! Some can contain beads that are too rough on the skin, which can irritate it further and have the opposite effect! Looking for a top-notch exfoliator? 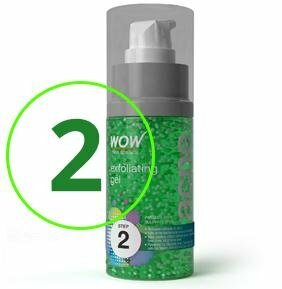 Get your hands on WOW Skin Science’s Exfoliating Acne Gel. This cooling gel utilizes the power of 100% natural micro-beads, which are gentle on the skin and don’t contain any artificial products that can irritate it. WOW Skin Science’s Exfoliating Acne Gel peels back the layers of the skin, refining pores and reducing the appearance of fine lines and blemishes. That’s all thanks to the glycolic acid present in this formula, a powerful ingredient that diminishes skin imperfections. What makes this exfoliator stand out is the addition of pure Tea Tree Oil, which has been shown to not only exhibit antibacterial qualities, but speed up skin healing as well. What happens after you wash your face and exfoliate your skin, stripping it of oil and residue? The obvious answer: dryness! Contrary to popular belief, dry skin is not better for you. In fact, it can actually be more irritated than oily skin! Why? Because dry skin is stripped of the protective layer that shields pores and cells from the bad stuff, making it more susceptible to inflammation and irritation. So after you cleanse and exfoliate, it’s important to hydrate your skin and provide that protective cover. There are many moisturizers out there that are too heavy because they are made up of ingredients that undo all the work of your cleanser and exfoliator. Sadly, there are also many popular moisturizers that overhydrate, leaving you with gross, greasy skin. 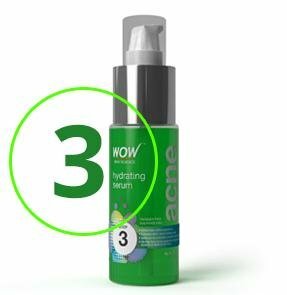 Choose WOW Skin Science’s Hydrating Acne Serum instead; this formula goes on light and doesn’t leave you looking oily and shiny. Whether you have naturally oily skin, dry skin, or a combination of both, this moisturizer can be a balancing ingredient that evens all of this out. Not only does WOW Skin Science Hydrating Acne Serum infuse the skin with just enough moisture to protect it, but it also promotes healing, perfect for repairing those scars or blemishes left over from acne breakouts. The star power in WOW Skin Science’s Hydrating Acne Serum is aloe vera, a natural ingredient known for soothing inflammation and providing skin with a burst of Vitamin C, which is essential for speeding up skin healing and boosting immunity. Why buy 10 different products when you can achieve flawless, acne-free skin with a single kit? WOW Skin Science’s Acne Deep Impact Treatment Kit is your one-stop shop for addressing problematic, acne-prone skin. This convenient kit contains all 3 of their acne-busting products: the Foaming Facial Acne Cleanser, Exfoliating Acne Gel, and the Hydrating Acne Serum. In just one kit, you can follow the 3-step method outlined above and ensure your beauty regimen is always complete. With WOW Skin Science’s Acne Deep Impact Treatment Kit, you don’t have to worry about getting a bunch of different products that may not be compatible with each other. All 3 products have been designed to work synergistically with each other to ensure clear, acne-free skin. Now that you know what acne is and what causes it, you’re in much better shape to fight it. But the best, tried and true way to get rid of acne is to follow a disciplined approach and adhere to the 3 steps: Cleanse, exfoliate, and moisturize (rinse, and repeat)! Can I use for my whole body . Bec back of my shoulders and thighs acne is their. Even in but some is their.